With all of the racial tension going on in Milwaukee and the rest of the nation, one would think that it would be incumbent to try to calm things down, or at least not fan the flames. It's one thing to express support for law enforcement officers, but to mock the unnecessary and unjust death of a black man goes beyond the pale. Being a social worker myself, I would like to know why Alexander thinks that's a bad thing. Or is she just using her career as a bureaucrat in order to be elitist? With the reference to the "four convictions" against Corder, she is being downright dishonest and deceitful. There are four cases involving Corder listed on CCAP. But two of them are small claims court involving the time when she lived with her brother and the other two are traffic violations. Not exactly the hardened criminal that Alexander is trying to portray her as. The really ironic part of her tweet is that she is not exactly law abiding herself. In just the past couple of months, she was caught using taxpayer money to send out a voter suppression mailer and then got lying about it. She is also under investigation for violating ethics rules by using her status to raise money for her father's funeral. People are already calling for Alexander to resign because of her extremely racist tweet but I don't expect her to do that. She doesn't have enough integrity or honor to take responsibility for her actions. I do, however, sincerely hope that her colleagues on the Milwaukee County Board will hold her accountable and censure her for trying to flame the fire under the racial tension in our community. She must answer for her inappropriateness and irresponsibility. But I have to admit I agree with Alexander on one point - she is broken. ADDENDUM: Here are some examples of incidents in which the person was not breaking the law and is not breathing easy - or even breathing - anymore. Wonder if she wears the t-shirt out in public, or only to klan rallies? Government would work better if more social workers held public office. I liked your stuttering over race relations in Milwaukee. If you'd been to a single one of the Hamilton marches, meetings or vigils, you'd realize that the tension and indeed the struggle is not confined to African Americans. Plenty of white folks got arrested too. It's actually racist of you to presume that any and all discussion of police abuse and crime must be direct toward or about black folks. Attend a march and then talk, fraud. Considering the "I can't breathe" is related to Garner, not Hamilton, I'm not sure what your point is. And yes, there were white people and Hispanics at the marches too. Again, I don't know what that has to do with Garner. You said the incumbent shouldn't be fanning flames due to racial tensions nationally and here at home. Garner didn't die here. So please describe the "racial tension" in MKE. I said in Milwaukee and the rest of the nation. I also said it would be incumbent, not the incumbent. But if you think that these protests are not related to each other, you really haven't been paying attention. Hamilton protests were going on months before Garner died. Secondly, the Black Sheriff of Milwaukee not only agrees with the Supervisor's tshirt but arrested 74 protestors whom you say were marching for race related reasons. So, if the tshirt is unspeakably racist, wouldn't a Clarke denounce it? Oddly, he's said more provocative things about the demonstrations than any other official or shirt. Who's not paying attention? Actually, I had already written about that. Apparently, it's you not paying attention. But even if Clarke is more provocative, it doesn't make Alexander any less so. Actually it does. That's what "more" and "less so" mean. No, one wrong doesn't make another wrong OK. They're both wrong. "Actually it does. That's what "more" and "less so" mean." Exactly what I was thinking @sarge. Wow. And yes yes yes yes @capper say it again!! "But if you think that these protests are not related to each other, you really haven't been paying attention"
Proving once again ...how Race is America's shame! One black man (Clark) supporting white racist oppressors does not make the oppressors perspective valid. Even some slaves stood up for their masters. But if you are white and trying to defend this woman you are a racist. Accept it and wear it proudly. The "black man said the same thing so it's not racist" is a false equivalency. Actually, that's Tommy Clarke's role- to give cover for white suburban racists by allowing the Sykes listeners to say "See, not all black people have a problem with our disgusting behavior." 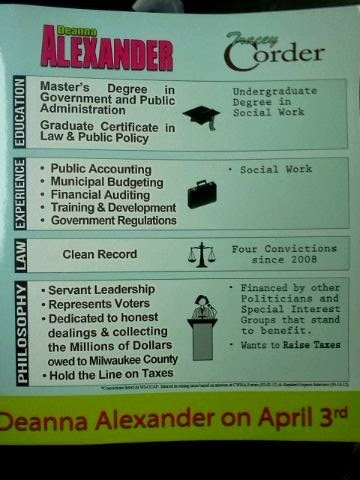 Alexander is a classic wingnut welfare case, and her dog whistle rings loud and clear. Notice how "law and order" should only be applied to THOSE PEOPLE in right-wing world? It's a false equivalency only if you believe there is a fundamental difference between black and white ppl. The idea that hypocrisy ends when the do-ers skin color changes is BY DEFINITION prejudice and at the very least racist. I'm sorry, but no mention of race at all is not an "overtly racist" tweet. Do I have to explain why hyperbole like this is not helpful? Ignorant, yes. Insultful, yes. Out of touch, Most definitely. Childish, absolutely. But Racist? Absolutely not. This writer took the easy way out. She's a lying, cheating, hypocrite whos entire political strategy has been nothing more than trying to make a scene, but to pull any racism out of this specific tweet is a bit of a stretch. If anything the author himself is the racist for instantly extrapolating race when absolutely none was mentioned. Just stop. The "white victimization" game is such weak sauce. How can you think it was ignorant, with a lack of insight and out of touch and NOT be racist? I can't get you suburb boys and your inability to admit the obvious. I think we all know who the "law breakers" she's referring to are. Excuse me Ms. Alexander. Many of those american citizens who are shot, tasered, choked, beaten, cavity searched, handcuffed and arrested did not break the law...they are guilty of being African American. Nothing racist about the remark! If you don't break the law the police won't confront you! It makes no difference what race you are! Really Anon a@ 5:32 pm. Tell that to the racists Cops who violate the civil rights of American Citizens. The only thing worse than racist cops are racists politicians and the bigots who elect them. Wing nut Wiggy calls for the stop of the protests. Like many of the exclusive rich white folk who live in the hills of Walkershau County, they miss the obvious. Why not call for the stop of racism? Admit it if Cliven Bundy and his supporters were black they'd have been shot full of holes. if 20 black guys with openly carried AKs and ARs had shown up to protest the open carry gun policy of private businesses, they would have been shot full of holes.